This is my third review on this cap. I highly recommend these and the AP Precise cap when all you have is budget/domestic cans or for cats who are starting out and want to sharpen their can control. These work great on Valspar cans with the trigger tops. Great for fills, cutting and force fields, very for crisp lines and tags and as well. These will work on domestic brand and international brands such as Rusto, PTx2, Rusto Universal, Valspar, Kils, Pylox, Leyland, P.P, and many other male valve cans. Valspar was a little watery to work with but having this cap around made it so legit to use. I first tried these with the ring attached. It works. Nice thin lines. But i was disappointed with lack of flare. Then someone told me to take the ring off like with the fat cap ap has. I figured it wasn't leaking so the ring could stay. So theres really 2 ways to use this cap. With the ring on u can get super skinny likes n soft slow spray. Pop the ring off n u get a cleaner slightly fatter flared spray. I enjoy catching small pimped out flare tags with these. I can tell for piecing they will be very nice. Similar to the ap fat, its slow and controllable. Like the little brother that won't clog as fast. 3.5 or 4 fingers fat, and i got lines skinnier than a pencil! Great cap for male valves like rusto's, unique flares on tags that i haven't got with any other can or caps. Works good for tight fades. A little misty and clogs quick after a few cans so keep em clean. this sh*t is great for piecing. it gives you great control with rusto or x2 cans. 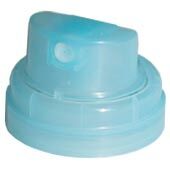 like the regular female fat, if you want to use this on rusto or x2, pop the blue collar off and push the cap on the valve until it snaps. the paint will come out a bit while doin this, but dont worry you wont use up that much. i love using these guys for outlines of my pieces and for all around borders. its also good for fills. i have found that these dont clog quite as easy as the v1 female donut fats, so in the future, i think i will be using these more often than those for the the fills too. although i havent used them a whole lot, i have done 3 pieces with these ez riders. the second two times i used it, i re-used the cap for both outlines. if i did this on the v1 donut cap, it probably would have clogged. thats why i like these. on the first piece i did with it, i used this for the outline, and i started to do the fill with this, but i switched to the v1 female donut fat instead, which i seemed to like better for that piece, although it was the first time using this cap... now these are great for the fills imo, so take that with a grain of salt. on the second piece, i used this for the fill and the outline and it was fat enough and turned out great. my recommendation would be to get these and the v1 female fat cap, and also the softie white/black fat cap and try em all out to see which you like best. im going to take 1 star off the review because its a bit harder to take these out of the housing without fear of warping or breaking the cap while twisting/removing the housing ring. i've remedied this by using a knife or a leatherman to cut the bend that connects the cap to the housing. the donut fats just snap out easy compared to these;but that is my only real gripe with these caps. all in all these are an awesome cap. get them if you want to turn your x2 or rusto into butter machines; everyone loves butter. I'm surprised to hear this was tested on Painters Touch. I find that on that or even other Rusto variations, this is weak. You have to press it pretty far down before it starts spraying, and when it does it gives a kind of soft, slightly sputtery line. I think it has to do with the part that engages the ring on top of the can. It does not line it up well to engage the stem. It also clogs easily if the can is cold. There is some nice variation in lines by how hard you press, but even so anything this can do can be done better by a different female cap. AMAZING CAP! this cap is great! it does the job! its good for rusto but if this was a male cap I would not use it!